Geo-fence involves categorization of specific regions as safe zones by defining virtual geographic boundaries in a Mobile Device Management software. The software then assigns specific policies to the devices when they enter or leave a fence. In the corporate world, employees may access confidential data using their personal devices (BYOD) or may take corporate devices with them. Either way, the security of corporate data can be at risk. And Geo-fencing could just be the solution for these business headaches. With Geo-fencing, devices can be configured according to their locations, by selectively enabling device functionalities at different locations. Let me give you an example. If you create a Geo-fence surrounding your school, certain provisions can be revoked from or granted to every student device entering the fence depending on the policy they have been assigned. Geo-fencing can be used in almost every field, including the ones listed below. Be it any kind of business, you will be concerned about the productivity of your employees. With the Geo-fencing feature, you can restrict the functionality of employee devices. Like, you can lock it down to just a few apps (Kiosk mode) or can disable hardware features. It also helps in maintaining the expenses as it ensures easy monitoring and control over the staff devices. Policies enforcing such rules get associated to staff devices when they enter your organization premises. Patient privacy is always of dire importance. So, the devices holding PHI should be accessible only within the hospital premises. The MDM with Geo-fencing feature allows medical reports available only at the point of care. Hospital boundary can be fenced so that whenever a crucial device leaves the fence, actions are prompted. With the pushed in-house apps, patients can review their status, schedule appointments and do much more. And with Geo-fencing enabled, doctors can get to know about the patients nearby and can perform real-time analysis and thus give away better consultation. Also, mobile healthcare units can be properly channeled. What if your employees are busy streaming when you have given them a work of importance? It is no longer a matter of worry. With Geo-fencing, you can control the way employees work. Applications needed, resources accessible and many other features of employee device will be restricted according to your policies, when they are inside your organization. Geo-fencing can also be used to assign resources to employees based on their roles. Policies stating what all provisions are granted or denied gets associated with the employee devices when they enter the Geo-fence. As schools also support BYOD, stringent measures have to be taken to ensure student safety. Questionable actions can be noted or prevented by establishing safe zones. Geo-fencing ensures proper student monitoring as it decides what all a student can do inside the campus with own devices. You can enable, only the necessary apps related to academics, can occlude inappropriate apps, websites and even site contents by blacklisting them. Can even disable hardware features like camera when they enter the campus. You no longer need complex hardware to manage the freight, it can be done using the mobile devices handy to the carriers. You can create a Geo-fence covering the entire deployment route, to ensure that there are no detours or unwanted resource wastage in between. Every transit en route can promise higher security, precise location based reporting, real-time coordination and improved planning with Geo-fencing enabled. As every coin has two sides, the Geo-fencing notion also pops up some challenges. Increased Cost – Use of GPS, and it also drains battery power. Hexnode MDM lets you create Geo-fences easily by simply dragging across the map overlay. 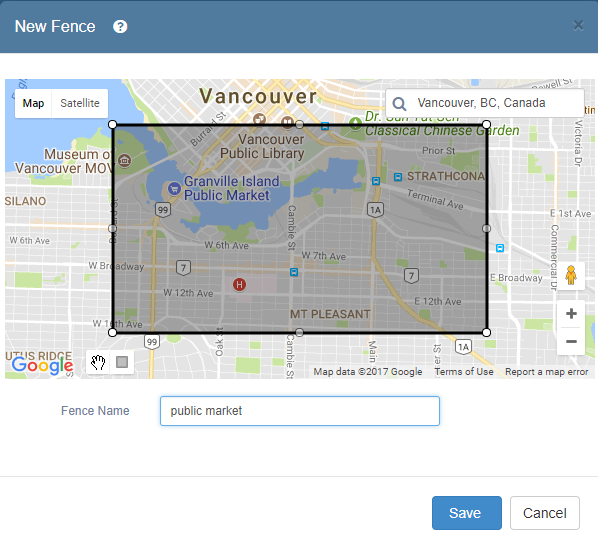 You can create multiple Geo-fences and conveniently name them based on their regions. Dynamic grouping allows you to choose Geo-fencing criteria to have devices automatically moved into a group when they travel in or out of a Geo-fence. This way, you can have all the devices with policy violations, together in a single group. Just assign a Kiosk policy to the group and all the devices get locked down in Kiosk mode! Pretty handy, right? You can also drill down to individual devices and view their location history or initiate further actions say, a device wipe. 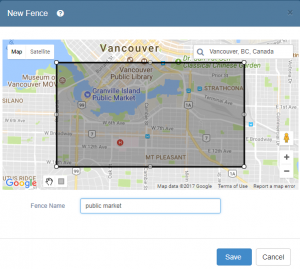 Geo-fences can be created by the admin with the use of MDM console by providing the Geo-fence name and selecting the desired area from the map. Dynamic groups can be constructed presetting the conditions based on which the devices should be added onto. And as devices enter the Geo-fenced area, they are added into these dynamic groups and the policies get attached, pushing actions to be performed. Once the policies get associated, everything else is seamless. The devices within the area can generate instant or periodic reports.And when a device leaves or enters the Geo-fence, Hexnode MDM verifies the Geo-fencing criteria mentioned in dynamic groups and moves the devices in and out of the groups. If any of the associated policies gets violated, prompt notifications enable you to take appropriate actions. Admin can send notifications to the devices from the console even in the kiosk mode. Single device messaging or broadcasting is possible. When employees bring their own devices, certain things are to be taken care of. Say, if you want your employees not to use social networking sites when they are at work, you can do so with Hexnode MDM, by blacklisting those applications when they enter the company premises. If a corporate or personal device (BYOD) gets misplaced or stolen, Hexnode MDM can help you ensure the security of data within with just a simple click. You can perform actions such as locking or wiping the device or removing certain provisions, regardless of its geographic position. To know how easy is Geo-fencing with Hexnode click here! !